John Vandeleur Stewart (1804-1872) was the most prominent private owner of Rockhill who extensively renovated and enhanced the house in the early 19th century. The glimmering Delft blues and crisp forest greens that accent the radiant, romantic design of this spacious and elegant suite are a nod to his Dutch merchant family connections. 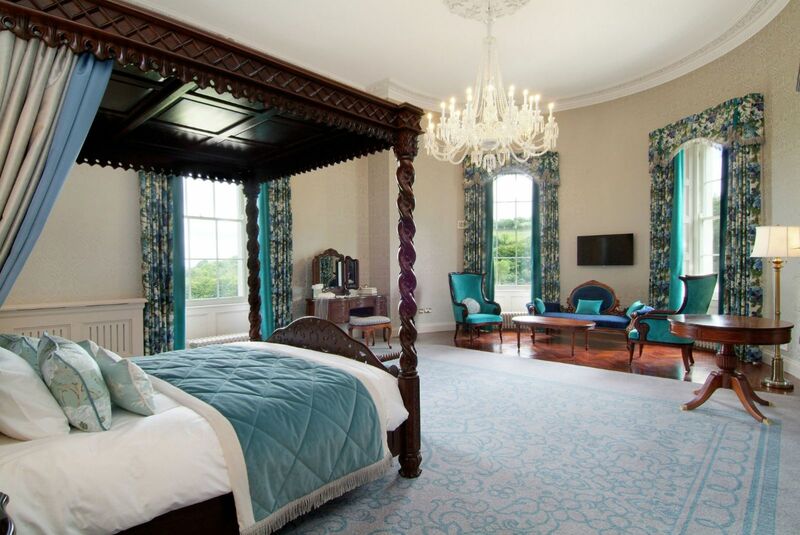 With its broad four-poster bed, crystal chandelier and plump chaise longue lolling beneath bright paneled windows, this suite offers an aspect on to the lawns and trees and the riverside town beneath that would have been the joy of its Georgian owner (who was a keen naturalist and ornithologist). 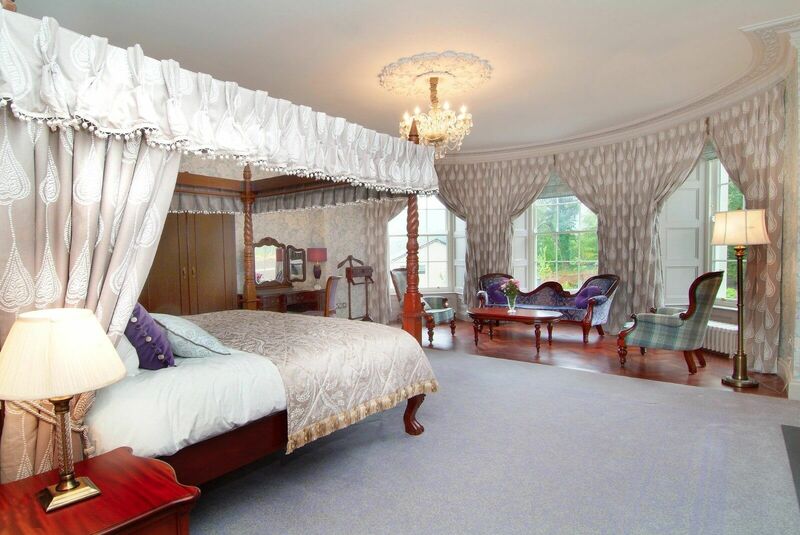 It’s an airily romantic setting that sets this room apart as the bridal suite that dreams are made of! The prodigious, elegant ensuite centres on a deep Chappell Green rolltop bath, set amid a silvery forest wallscape. Surely the most relaxing, refreshing bathing experience to be found in all of Ireland! This perfectly appointed south-east facing suite is decked in luscious foliage and bird of paradise wallpaper in lemons, pearls and corals that dance exuberantly off the walls. The luxe, airy bathroom with bold India yellow roll top bath is the added fizz that makes this a truly joyous setting – a place apart that’s sure to excite your humour and inspire dreams of exotic travels and expanded horizons. Lady Helen Graham Toler, daughter of the Earl of Norbury, married John Vandeleur Stewart in 1837 and they made Rockhill their own with a lavish remodeling the house and lush replanting of the lands. 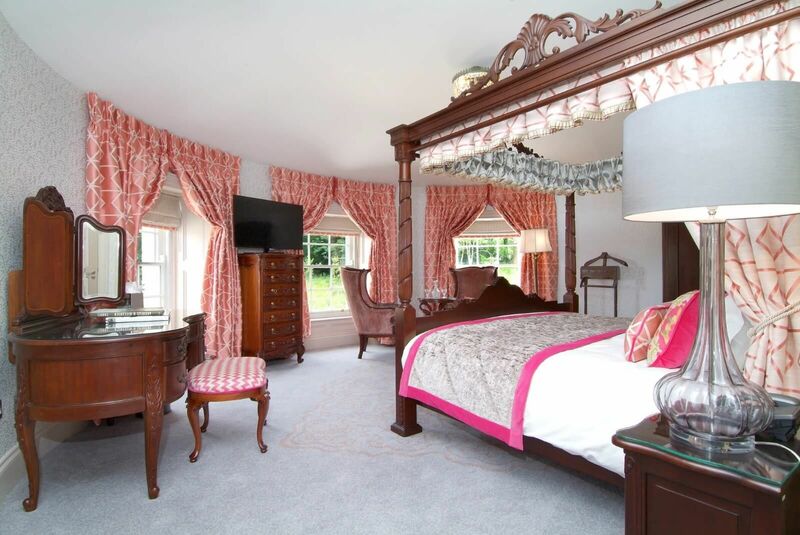 This suite, in its soft golds and uplifting purples, reflects Lady Helen’s refinement and creativity. Plush tweed armchairs create their own conversation with the unique Donegal textile art on the mantelpiece; and the ensuite is another revelation with its rolltop bath, glorious rain shower and pretty shuttered windows.